As regular readers of our Los Angeles DUI blog know, the crime of driving under the influence is anything but monolithic. Your blood alcohol concentration and subtleties regarding your arrest and criminal history (if any) can dramatically influence your potential punishments. For instance, if you test just over the limit (0.08%), you will face lesser charges than if you test way over the limit (0.15%+ BAC). Our neighboring state, Arizona, has similarly stratified its DUI punishment scheme, and P.J. Tucker, a forward for the Phoenix Suns, may soon become intimately familiar with the gradations. 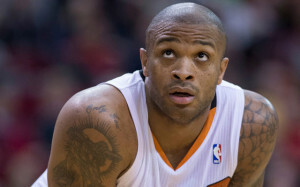 According to the AP, the star forward just pled guilty to “super extreme” DUI. He will spend three days in jail and 11 days in home detention. Police pulled Tucker over in Scottsdale on May 10 and tested him to have a BAC of 0.22%, two and three quarters over the legal limit. In addition to the jail time and home detention, Tucker will pay a fine of $2,750, go through alcohol counseling, use an interlocking ignition device in his car for the next year and a half and undergo probation for five years. Tucker’s case is important for at least two reasons. First, his arrest demonstrates that even highly successful, motivated and publicly visible people can and do make grievous DUI mistakes that can lead to major punishments. Just because you’re an NBA forward does not mean that you are immune from the laws of the land and that you can’t wind up behind bars. Secondly, the Tucker story also shows that resilience is possible. Although Tucker faces long-term inconveniences, such as probation and an IID in his vehicle, he still managed to lock a $16.5 million contract, and his team has given him a second chance. To build an effective Los Angeles DUI defense, call attorney Michael Kraut of the Kraut Law Group today to schedule a free consultation with a former high-level prosecutor who has won significant renown for his work and who has great relationships not only with clients but also with Los Angeles judges, prosecutors and police officers.